Who Invented the Cheeseburger? - Who Invented? / FEATURES / Who Invented the Cheeseburger? Lionel SternBerger – The Cheeseburger was invented by Lionel Sternberger in the USA in 1926. 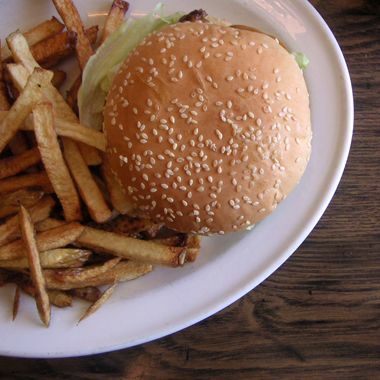 A number of claims have been made as to who created the first cheeseburger but the earliest is that of Lionel Sternberger who was working as a chef at his father’s sandwich shop, ‘The Rite Spot’ in Pasadena, California when he dropped a slice of cheese onto a cooking burger to see what it would taste like. ‘Cheeseburger’ was awarded to Louis Ballast of the Humpty-Dumpty Drive-In in Denver, Colorado, though he is said to have applied for this as early as 1930, thus pre-dating any claims by Kaelin’s. Obviously, a cheeseburger has cheese in it, this is usually processed cheese slice(s) when served in fast-food restaurants but can be more gourmet by including Swiss, French, English or Italian cheeses for more flavour. The cheese is often placed on top of the burger but can be in between when a Double Cheeseburger or more is ordered. There is also a variation where the cheese is actually inside the beef burger. In addition to the burger and cheese, almost any other standard burger topping can be included to provide many variations of the Cheeseburger such as avocado, bacon, fried onions, salad, tomatoes, mushrooms, mayonnaise, ketchup and so on.